Dhaka, Jan 5 (Just News): The police foiled rallies and processions the opposition Bangladesh Nationalist Party (BNP) organised at places across the country on Friday to observe what the party called 'Democracy Killing Day'. At least 10 BNP activists were injured as the police charged batons and lobbed teargas shells to foil the BNP’s programmes. Several BNP activists were also detained. The country’s principal opposition political party chalked out programmes to observe the fourth anniversary of the controversial geleral elections held on 5 January 2014. The fourth anniversary of the one-sided ballot, which falls on Friday, was observed in different manners by different political parties. Like previous years, the BNP had sought permission for holding a public rally at the capital’s Suhrawardy Udyan to mark the day, but the AL-led government denied it the permission. The BNP leaders alleged that the police harassed its activists, did not allow them even to enter their local party offices and charged batons when they tried to bring out processions at different parts in the country. The BNP could not bring out their scheduled ‘black-flag procession’ to observe the ‘Democracy Killing Day’ due to the police obstruction in Mymensingh. In Gouripur upazila in Mymensingh, at least 10 BNP activists were injured in the police’s baton-charge. In Khulna, the police men charged batons on a BNP procession and detained at least three of its activists. In Mynmensingh, the BNP decided to observe 'Democracy Killing Day' on 5 January. The party was scheduled to bring out a black flag procession from the BNP office in the south of the district. But BNP leaders and activists could not go to the party office as the police cordoned off it and houses of many leaders including BNP local unit general secretary and Jobo Dal president Shamim Azad. The police also started guarding the houses of those leaders since the morning. BNP general secretary of south district unit Abu Wahab Akanda said, "The police harassed me in the name of raids. They harassed many leaders. The police even did not pay heed to the pleas of some who said their children are sick." Shamim Azad said the police broke the main gate of his house and carried out vandalism inside his house. A huge number of law enforcers were seen during a visit to the party office on the Hori Kishore Roy Road in Mymensingh town on Friday noon. The party office was locked and law enforcers were there at the entrance. Mymensingh's Kotwali police station inspector (intelligence) Mushfiqur Rahman said members of the police were deployed since the morning at the BNP office fearing 'act of sabotage'. Nobody had been able to enter the office, he added. 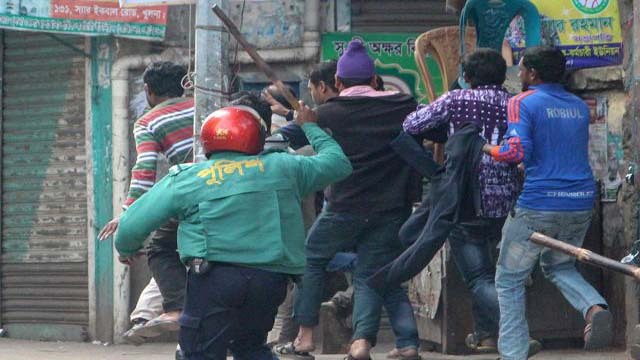 The police charged baton on the BNP procession at Gouripur upazila. At least 10 leaders and activists including Gouripur upazila chairman and also BNP joint convener of the north Ahmed Tayebur Rahman were hurt. The BNP brought out a procession from the Cinema Hall Road of Gouripur municipality in the morning. The police intercepted the procession. In Khulna, the police charged baton on the BNP procession organised to observe 'Democracy Killing Day'. The Khulna district BNP and later the metropolitan BNP held rallies. BNP leaders and activists from various parts of the district joined the rallies. All of a sudden the police charged baton for chanting slogans from a procession. At that time the police picked three activists. When the police misbehaved with the leaders and activists at the rally, the activists threw chairs and brick chips at the law enforcers. When the situation became normal, the BNP started the rally holding black flags. When the BNP leaders and activists tried to bring out a procession holding black flags, the police foiled it.